How to stop your knitted hem from flipping up. Terrible photo but it's all I have. The hem flipping was extreme. It flared out like a penguin flipper in Mary Poppins. This is a total bugger when it happens. You are knitting, or you've finished knitting, and you notice that you have the flip. So what to do? I have a couple of tricks that I thought you might like. Let's start with why it happens. The basic reason is a change in tension between the two types of knitting, whether this is a ribbed hem or a garter hem. When you rib you end up with more fabric than when you knit stockinette. Think about the process of making a rib. In between each "rib" you need to switch from knitting to purling and each time you do that you move the yarn from the front to the back (or vice versa) before making the next stitch. That means you have a tiny sliver of "extra" yarn between each stitch (for k1p1 rib) or two stitches (for k2p2 rib). The tiny sliver of extra yarn means as you end up with more yarn and therefore more fabric than if you were to knit the stitches in stockinette. The extra fabric causes the rib to flare, and at the point at which you change from stockinette to rib it flips. It is all about tension. Change the tension, cause a flip. Anyhoo, the whole problem is annoying but really fixable provided you are willing to experiment and rip a row or two here and there. How do you stop it. I often combine more than one trick. The main thing you need to do is to decrease the amount of fabric in your band. You can do this using Trick 1 and Trick 2. Both of these methods decreases the amount of yarn/fabric you have in the band thereby pulling it in a little and decreasing the hem's desire to flip. Trick 3 is specifically for rib hems. It involves altering the tension at the change point by reducing the amount of fabric at the point of the flip by slipping the knit stitches of the rib. This hem was tamed by simply changing engaging with Trick 2. You decrease the number of stitches by doing a k2together every few stitches [k2tog kX] across the row on the last row of stockinette or the first row of rib ( for a top down sweater) or on the first row of stockinette (for a bottom up sweater). This is part art and part science. There are no rules to exactly what the repeat should be. I vary my repeat from a [k2tog, k8] which was often the recommendation by Elizabeth Zimmerman right down to a [k2tog k3] for a straight sleeve. How do I figure it out? I often try something, see what it looks like, and rip it out if it isn't tight enough or is too tight. So get started by choosing a repeat in between and try it. Rib Band: I often do [k2tog k8] when going into a rib band because the very nature of the rib is that it pulls inwards. Sometimes this still isn't enough to pull the band in when going to garter. Please note that it does not matter whether the repeat fits into the number of stitches you have on the needle. Just keep doing the repeat till you get to the end of the row. This is often used in patterns for hat bands or sweater bands but I also often use it even if the pattern doesn't recommend it. For example often my finished Granny's Favourites end up with stretched out necks because of rough-and-ready small girl children. So I always knit the neck band on a 3.5mm or even a 3.25mm band to make it a little smaller. This example obviously isn't about a flip but it has the same principle in that we are trying to reduce the amount of fabric created for the band. I often also do it for bands at the bottom of sweaters. This is a trick that works really well with a rib band. I generally use this one one where I am shifting from a rib band into stockinette - so bottom up sweaters. On the change row, rather than just knitting the whole row, I slip each of the knit stitches and then knit all the purl stitches. I have used this trick on both a k1p1 and a k2p2 rib band. The flip doesn't happen because you are changing the tension by making it tighter at the flip point with all the slipped stitches. A non flipping hem. That I am happy with. Near enough is good enough and completionism rather than perfection. I adore this jumper. You can still see the tension change between the band and the body as it dips in. This could be the result of taking out too many stitches....? James III is the sweater that inspired this post. I got to the end of knitting it and finished the band only to block it and realise that the flipping (which sometimes will block out!) was extreme. I ripped the band out, put the zillion stitches back on the needle and started again. I did a combination of Trick 1 and Trick 2. I changed my needle size from a 3.75mm to a 3.25mm on the first row of rib and also did a repeat of [k2tog, k1, p2, k2, p2] which means that I decreased one stitch every 9 which is roughly 10%. It isn't perfect but it is much much better. I'm happy to answer questions if you have them? And would love to hear if you have any other tricks you use? And if you don't then here is wishing you a hem-flip-free future. So this really should be an Around the Traps style post as I am just pointing you to resources by other smart people. However, many moons ago before I went travelling and broke my camera, I started this series with a Part 1 - Knitting Tips and Tricks and thought I should continue in that vein. And do I have tips and tricks for you. I LOVE these. You must go and check them out. I often get asked about sleeves, along the lines of "what is the best way to knit them"? I want to give you an answer but the answer may be a little unsatisfying - and that is "whatever way you choose" or "whatever way is comfortable for you". You really do need to try them all out and your choice may change over time or depending on the project. In the past I have altered nearly every single pattern to be able to knit sleeves how I want. Traditionally for me that meant knitting sleeves flat and seaming them, even with a seamless garment. I didn't like knitting little tubes. But then I met Georgie and she quietly (in that lovely way of hers) convinced me to give small circular needles another try. Small circular needles are small 30cm circulars (or sometimes even smaller) with bent tips. I use the Addi ones. I did hate them but have come to see that actually, with a little practice, they are actually very speedy. I ALWAY need to go up a needle size with little needles though as my gauge tends to get tighter - which makes sense if you think about how they are knit. Because the stitches are held in a small tube rather than stretched a bit on normal needles, the yarn between stitches is pulled a little tighter, and this leads to tighter knitting. When choosing the method to suit you, consider that everybody has their own knitting quirks; different styles, different hands, different levels of finger flexibility. So what you might find comfortable and comforting I might not. You really do need to try all styles - and try them more than once. It takes a little while to get used to and comfortable with a new style. Georgie talks about options for different ways to knit sleeves in this post. She also gives her amazing way for picking up underarm stitches in this other post. Towards the bottom of the post Georgie mentions that in the very next round, after the round where you have picked up your stitches, you need to do a ssk and a k2tog. You do these at the join between the new underarm stitches and the existing sleeve stitches, to close the gap. You do a ssk when you get to the end of your existing sleeve stitches, knitting one of the sleeve stitches you were holding on waste yarn together with one of the new underarm stitches. You follow that up with a k2tog when you get to the last of the new underarm stitches, which closes the gap between the underarm stitches and the existing sleeve stitches. You will love this underarm. It has no gaps and looks great. I use it on every top down seamless pattern I make now. So yesterday I was talking about how materials matter. How 100% wool does not equal 100% wool in all cases. I know this is a tricky subject when you are a new/intermediate knitter as there are all these new words and who knows what they all mean? Have I got the podcast for you - two podcasts actually. There is a podcast called Knit FM by Hannah Fettig and Pam Allen and it is a true wealth of information. They cover Yarn - Part 1 and Yarn - Part 2. Get stuck in - if you are even vaguely interested in yarn you will love it. I just love Pam's voice. She sounds so lovely you will want to give her a hug - or maybe that's just me? One final thing today - A small few-but-mighty of you took me up on my Stash Less Ripping Challenge. I'm going to send a little something to the brave Libby who ripped out this lovely cabled cardy. Yay Libby! Unfinished but the steek has been cut! Knitting and photo by Felicia Semple. So I finally found the time and space to cut the knitting. The delay was more about finding time when I had clean fingernails, and someone to take a photo for me, than an issue with the steek. Long term camping is not always very glamourous. Especially in the rain - and we have had a lot of rain in the last week. The dirt gets so stuck under your nails, and ingrained in your finger tips that only a good soaking will get it out. And there is nowhere to soak. I digress. With the help of my middle child, I cut the steek! And I have to say that it is one of the most fun things you can do as a knitter. Even as I write this down I can hear that it sounds a bit nanna. But it's not. It feels devilish. Like smoking at the milk bar around the corner from your house when you were 16. Not that I would have done something like that ;). This post is not a how-to. More a progress report. I have posted a short instagram video clip if you want to watch or have not yet seen a steek live. And if you were after a how-to I have two options for you. 1. In person. Sadly/happily our Steeking workshop, which is taught by Julia Billings at this year's retreat, is fully booked out. I'm thinking we should possibly repeat it next year as it was so popular! 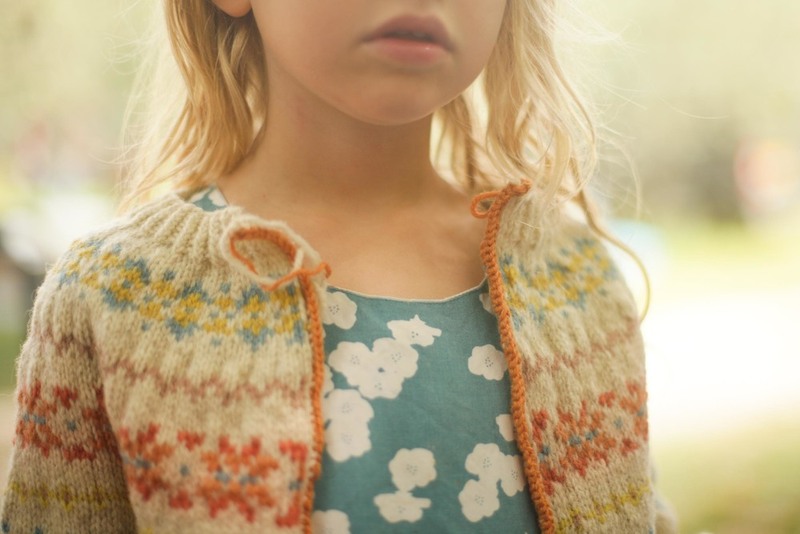 In the mean time you can experience Jules teaching steeking at Sunspun in Melbourne in October. Please contact them for the details. 2. Online. Have a look at the lovely Kate Davies site where she shows you how it is done. She also has a great post on different types of finishes here. There is also a fantastic series on steeking by Eunny Jang in her defunct blog. This was how I first got my steeking confidence. It is a great read, as is much of the rest of her site. The cardigan still isn't finished - which I like. I like that it has been my companion over these last four months as we have travelled about. And while I have knitted numerous other short-term projects over our time away, nothing that has the love that has gone into this work. This project has meaning to me. I learnt, I persisted and I'm hoping to love it. It still needs button bands and an extra motif added to each sleeve to make them a little longer. I'll let you know when I'm done. Have you ever steeked anything? Does the idea of steeking make you feel the joy? Or some fear…. PS. Only one week to go until registration closes! Feel free to email me if you have any questions about workshop availability. Another new ongoing mini-series prompted and inspired by the lovely Jen and Martine - my mates who I have been assisting through the process of beginner knitting. Working with them has made me realise that there are so many things about knitting (and also sewing but that is for another day) that it isn't possible to learn in books. And it is really valuable stuff. The kind of stuff you learn from experience and experimenting. From being in the right place at the right time with the right knitter. Or picking a pattern that usefully tells you how to do something. So much of knitting is assumed knowledge and I am only realising through working with them all that I actually know more than I think I do. It's the little things. And so I have decided that occasionally, as I think of them, I will write them down for you in the hope they help you. First up we are going to do counting. An oft overlooked annoying point for knitters. Counting stitches, counting gauge and counting rows. I can make it easier. This is possibly the best "trick" I know and it isn't even a trick. But it will change your life if you are a knitter! I have no idea if I made it up or I read it somewhere. My apologies for not crediting the genius that came up with it (if there was one), but I have been doing it so long I don't know to not do it y'know? Doing a stitch count to check you are on track is one of the only times where I condone counting in knitting. Generally I think you should learn to read your knitting and so there should be little reason to count. Stitch counts here and there however, are essential. Really important. Later in my knitting career I started counting in twos. 2,4,6,...you get the picture. Still loosing count and still wasting my life and my knitting time. So the trick! - the trick is to count in FIVES!! Yes fives. I swear this is life changing. Your eyes can actually clock five stitches at a time. They really can - five stitches look a certain way. They make sense to the eyes and make it so much quicker to count and much much harder to loose your place. You may need a small amount of practice but you can pick this up really quickly and it will save you SOO much time. All about the joy! I often hear of people struggling to count their gauge and so I thought I would share what I do which makes it super easy. You just need a few sewing pins, a ruler or tape measure of some description and you are good to go. Lay your swatch on a bed/couch/something firm but squishy. Take out your tape measure and lie it towards the top of your swatch. Make sure that you follow the line of stitches across from your first stitch so you are measuring along the same row and not crossing rows. Mark out the start and finish of your 10cm/4" with pins making sure that you start on the left hand side of a V - see our Learn to Read Your Knitting post - Part 1 if this doesn't make sense. Put your final pin in exactly where the 10cm/4inch mark is. Mark the start and the end, making sure you begin on the left hand side of a V.
I find it easier to use a different colour pin to mark each 5 stitches. Look for the Vs.
Leaving the ruler/tape measure in place put a pin in every 5 stitches. You can do this easier because you know that you are looking for the Vs - right. Five Vs then a pin and then another five Vs etc until you reach the 10cm/4inch mark. Leave the pins in and then count the number of left over stitches between the last marker for a five and the final pin that marks 10cm/4inches. Make sure that you count 1/2 stitches and even 1/4 stitches at the end if you have them. Be as accurate as you can. And here is the critical bit....Repeat towards the bottom of the swatch. It also helps if you do it before and after you have washed your swatch. This tells you what gauge you will be getting when you are knitting, as well after it has been blocked. This shows that we have 3 and 3/4 stitches in the last bit. Giving us 23.75 stitches as the gauge. In the Learn to Read Your Knitting - Part 2 post we talked about counting rows. The best way I've found is to mark the first V you are counting with a pin in the hole of the stitch. Then stretch the fabric slightly before using the needle tip to count the Vs going upwards. 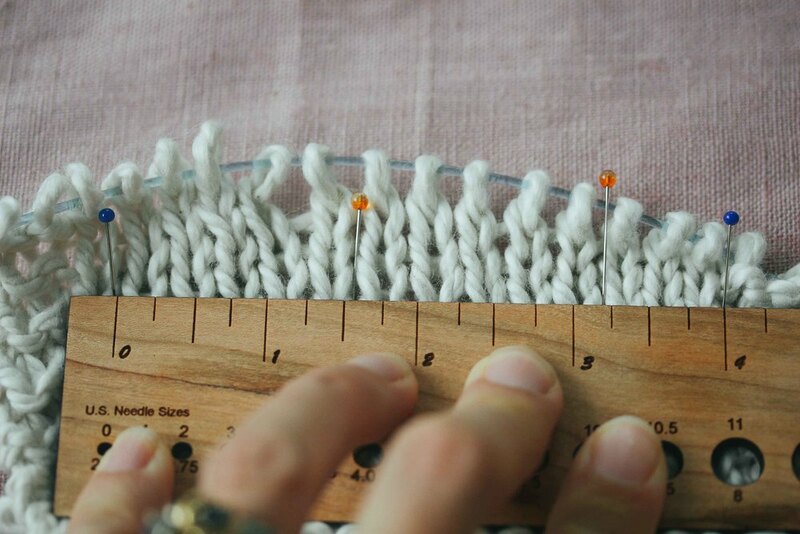 Stretching the fabric width-wise and length-wise makes the individual stitches easy to see. You can also use pins here to mark 5 rows to make it easier, or you have a lot of rows to count. Same two examples for you - which I like because they are both lightly hairy yarn (both contain alpaca) and are slightly harder to read - which is good because you can see that using this stretching pin "trick" you can easily see the stitches. The other thing that will help is to put a contrasting colour on the table behind the knitting when you are trying to count. Then when you stretch the knitting you can more clearly see the holes. If you have light coloured knitting use a dark fabric and vice versa. I didn't realise before I wrote the post but the key to counting is 5.....who knew? I really hope that was helpful. Try the counting 5s thing. It really is lifechanging. Let me know if you like it.